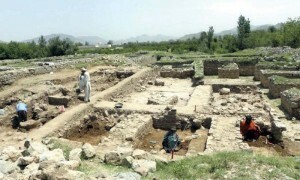 TAXILA, May 9: A stupa dating back to the 3rd Century BC was discovered at the ancient Buddhist site of Badalpur near Taxila during excavations carried out by the Taxila Institute of Asian Civilisations (TIAC) of Quaid-i-Azam University. The stupa measuring 25×25 was discovered on the southern side of the main monastery with a centre water tank at the ancient Buddhist site. Coins, pottery and metal objects have also been excavated from the site by graduate and doctorate students of the TIAC. The students were led by the institute’s director, Professor Dr Ashraf Khan, Assistant Professor Dr Sadid Arif and Coordinator Mohammad Ibrahim.